Please take a look at our Welcome Booklet. 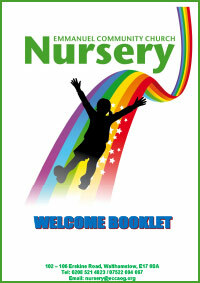 All parents are given a copy when their child starts nursery. It is our prospectus and will give you much more detail about the Nursery, ranging from snacks to settling in, clothes to curriculum and staff to safeguarding and much more.